In this post we take a look at the important questions you should ask when looking for data loggers. Since our founding over 50 years ago, data logging has always been a key requirement for our customers and as technology and regulations have evolved so have our products and solutions. We now offer a wide range of devices but it can get confusing knowing which approach to take. Accuracy/Calibration – How accurate do you need the results and do you require calibration. Environmental Conditions – Both the logger operating conditions and monitoring conditions. Parameters – Fairly self-explanatory but consider things like calculated parameters (dew point) , it might be better to use two separate devices rather than one. 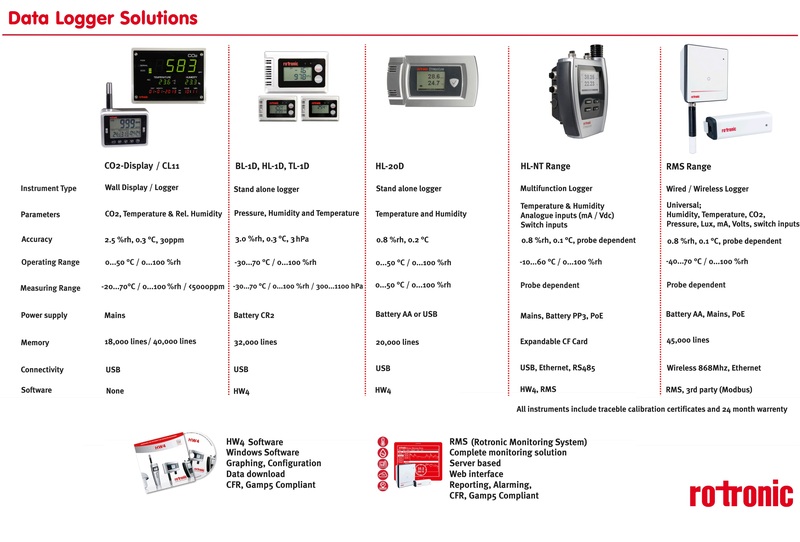 Rotronic offer Humidity, Temperature, CO2, Differential Pressure and Barometric pressure probes, but also many of our loggers accept analogue input signals so you can utilise existing or 3rd party instrumentation. Accuracy & Calibration – Accuracy specifications can be mis-leading, if you care about your measurements we would always advice pre-delivery calibration. Also consider that often bulky loggers can be slower and more costly to calibrate vs devices with external probes. When considering humidity measurements drift is also a key factor. Environmental Conditions – Consider both those you need to measure and where the logger will be placed. Many loggers have cable probes that can tolerate adverse conditions where the logger itself cannot. Also be wary of battery life, it is typically only stated for use at ambient conditions. Access to Data / Reporting – Simple loggers typically require manual downloading of data. For large installations or where regular reporting is required this can quickly become a laborious task. Alternatively look for devices with a permanent connection to the monitoring software. Our latest RMS software provides live alarms, automated reports and users can access live data through a simple web browser, often saving time and money in the long run. Simple reporting is also key so that data can securely be shared. In compliant applications you may also require the ability for users to validate report authenticity. Local Display – Useful for many applications but as data becomes always available can a mobile device act as the display for you data logger. For large spaces consider the ability to build dashboards in your software so that users can see data whilst operating. Power Requirements – Devices with non user replaceable batteries lead to downtime and additional costs. Where possible mains or PoE connections ensure battery life is not an issue. Our latest wireless devices ensure >3 year battery life even when logging and transmitting data every minute. Memory – Should be secure in the event of battery or power failure and sufficient to last either between download events or as a back up in case monitoring software / network connections fail. Cost – Best to be realistic with your budgets, consider the time costs for not acting and down forget on going service costs such as validation and calibration. As you can see from the simple overview above it is virtually impossible to have one logger for every application. At Rotronic we have a diverse range of solutions and even these do not cover all eventualities. If you have monitoring requirements please do contact us to discuss further.